I want to get one thing straight right off the bat: I kid because I love. I love Marvel Comics. I love the X-Men. And from Schism to Secret Wars, I absolutely loved what Marvel was doing with Cyclops. They made him the most fascinating character in their universe, with more shades of gray than a steamy, fan fiction romance novel. Which is why I’m so disappointed that Marvel is completely futzing up Cyclops’ story in the current Inhumans vs. X-Men crossover. All the nuance and complexity is gone as they forcefully paint Cyclops and the X-Men as monsters — until the new issue this week, which might just prove that Marvel knows what they’re doing after all. And it all hinges on that most interesting of new characters, Mosaic. For those of you who don’t know, Mosaic is a new Inhuman with the power to jump into your mind and control you like a puppet. He’s also the star of his own brand new ongoing solo series, which is very rare for Marvel these days. They don’t just go around handing ongoing solo comics to brand new characters. I’ve been reading Mosaic and it’s alright. Personally, I think it’s wasting time on surface level stuff instead of diving into the real drama that’s simmering in the background, but maybe that’s just me. Regardless, Mosaic is a pretty interesting dude, and he plays a pivotal role in this week’s issue of Inhumans vs. X-Men. How pivotal? Join me after the jump to find out! Also, between all of his appearances in this event, I don’t think the memo is going around about how Mosaic’s body-control powers work. SPOILERS for Inhumans vs. X-Men #4, as well as the Mosaic ongoing series. The pivotal moment comes when Mosaic uses his powers to infiltrate the X-Men, take control of Magneto and learn the truth behind their war with the Inhumans. Then he hijacks Young Cyclops and makes his escape, reuniting with the other new Inhumans to pass along the intelligence he’s gleaned. And here’s where things get interesting. Turns out, not all of the Inhumans know why they’re fighting. It’s been 8 months since everybody learned that the Terrigen Mist was killing mutants. They know this. But did they know that Beast was working on a cure? And that he didn’t find one? 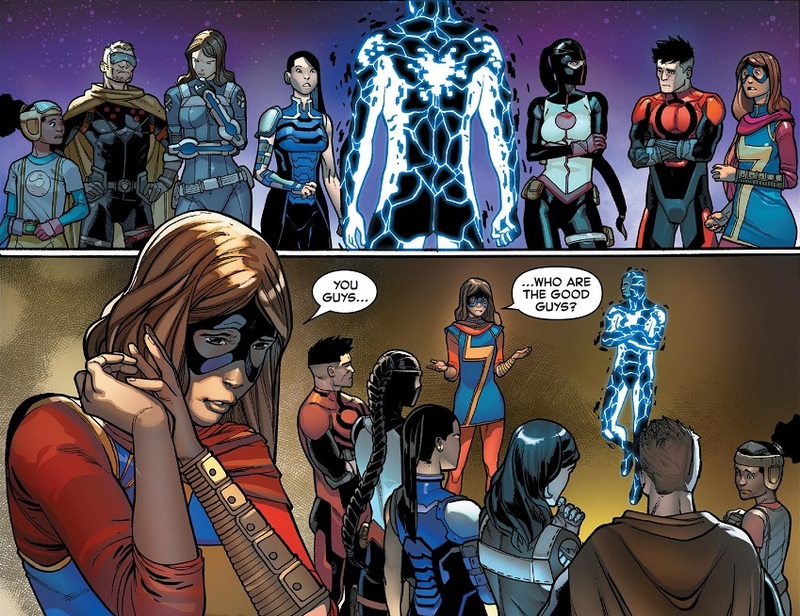 I checked the first issue of the crossover and discovered that what Mosaic is telling the rest of the team is correct: none of the Inhumans knew that the Terrigen Mist was about to saturate the entire globe. Beasts said he went to the X-Men with that information first, and then they detained him before he could go warn the Inhumans of their impending attack. So in this whole conflict, the Inhumans don’t know that the Terrigen Mist poison has almost reached its saturation point. 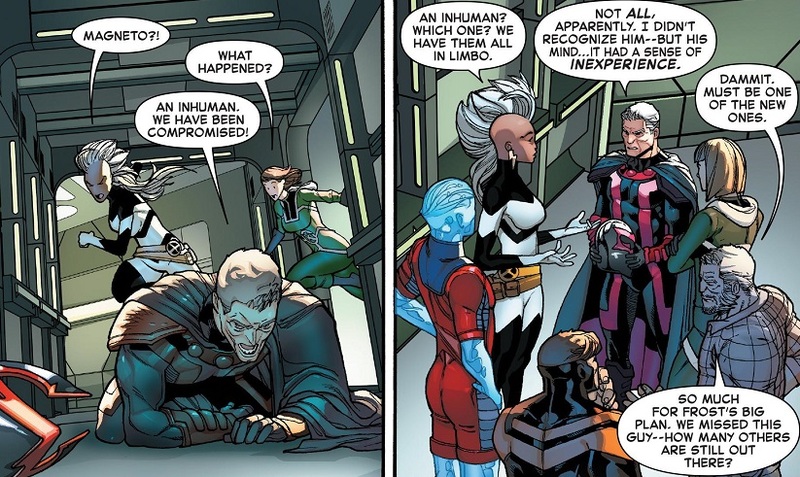 On the one hand, this makes the Inhumans a little more sympathetic in this conflict. On the other hand, they have known that the Mist kills mutants all this time and they have refused to allow the X-Men to stop it. So yeah, Inhumans are still religious fantatics, but they don’t know the whole story or the exact impetus of the X-Men’s attack. And when Mosaic tells the other new Inhumans, they don’t take it very well. I would definitely consider this an interesting development. Of course, Marvel might just be setting up the Inhumans for a get-out-of-jail free card, a couple of them, actually. When the rest of the Inhumans find out the reason for the X-Men’s attack, are they all going to change their minds and say, “Whoa dudes, if that’s the case, you can totally destroy the cloud. You should have just come to us in the first place.”? And then maybe yell at Emma Frost for creating that Cyclops mirage? That way, both sides will come off as good guys and Emma can take the blame for everything. Ignore the fact that the Inhumans fully believed they were killing Cyclops, and ignore the fact that they refused to let the X-Men destroy the cloud even though everybody knew it was killing mutants. Emma Frost lied about Cyclops, so she’s to blame for everything! That’s my prediction in all of this! But my predictions are usually wrong. Now then, on to the real meat and potatoes of this article: I don’t think the memo got around about how Mosaic’s powers work. Based on his ongoing series, when Mosaic jumps into somebody’s body, he gets a big multi-screen control center to operate in. This gives him access to his host’s memories and thoughts. From here, he can control the body. While he’s inside, the other person is shown curled up in the fetal position inside this memory control center. They don’t talk or anything, they just lie there. When he’s done, he just jumps into another body and gets their control center. And from the evidence we’ve seen, including the new issue of Inhumans vs. X-Men, it seems that the hosts are perfectly fine after Mosaic leaves their bodies. Here’s what happens to Magneto immediately after Mosaic leaves his body. 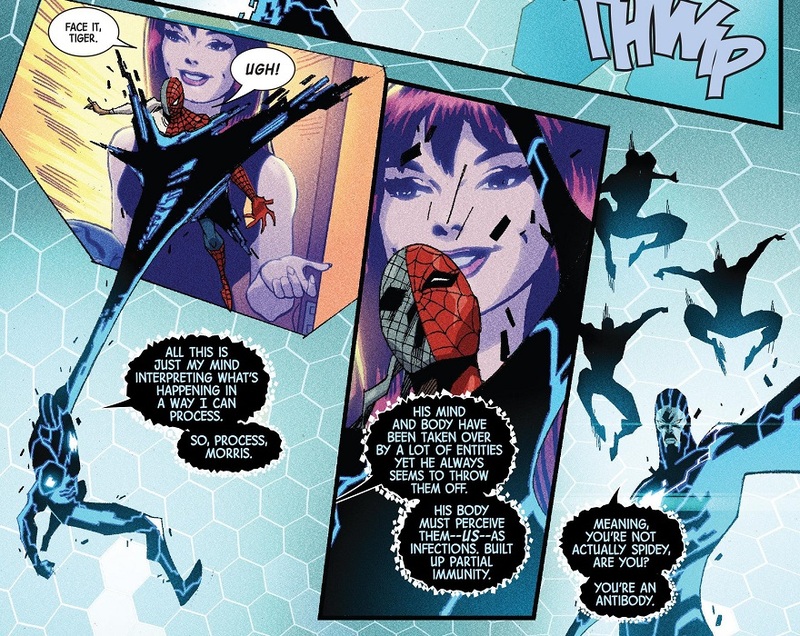 One time, when he possessed Spider-Man, Spidey’s mind was able to create a whole bunch of mental anti-bodies to try and force Mosaic out of his mind. This was possibly because Spider-Man is used to having people in his mind, and he had defenses. Mosaic had to physically fight these antibodies inside the memory control center. My point is, that’s not the real Spider-Man. That’s not his fetal position self taking arms against Mosaic. It’s some kind of mental defense system. So where am I going with this? Well, Mosaic’s takeover of Young Cyclops is a big deal for the latter character’s growth. In last week’s All-New X-Men #18 — the same issue where Young Cyclops revealed he’s an idiot — we get a completely warped use of Mosaic’s powers. 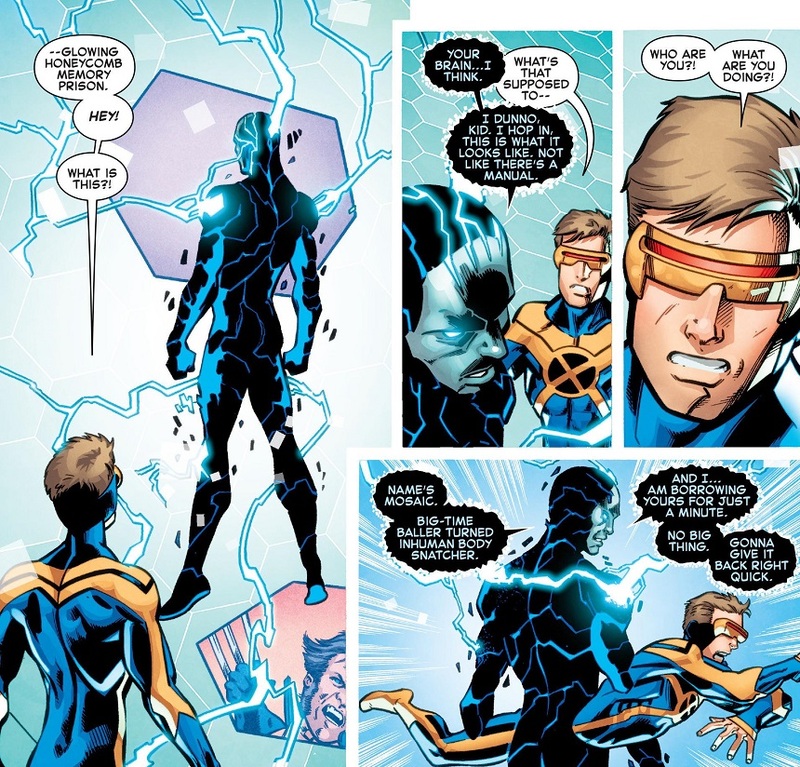 First of all, Young Cyclops is not only awake inside the memory control center, but he’s able to walk around, converse with Mosaic and even view the memories of past hosts. Cyclops also jumps through Mosaic’s body, so clearly this isn’t some kind of Cyclops antibody. Cyclops takes a look at Magneto’s memories and realizes that Emma Frost used a mental protection of Old Cyclops to get the X-Men to destroy the first Terrigen Mist cloud. Cyclops is pissed off about this, because it means that the big, ‘evil’ act that the world hates Cyclops for was actually committed by Emma Frost. So Young Cyclops is angry at Emma, and no doubt this revelation is going to bring down the entirety of Inhumans vs. X-Men. But Cyclops can’t just rush off and tell the other X-Men, because apparently, Mosaic’s hosts need 12 hours to recover from their possession. 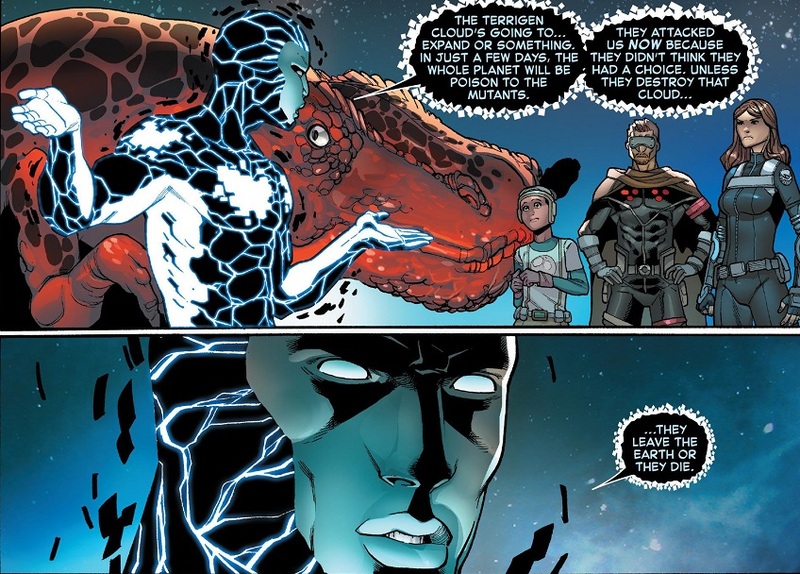 Also, how can Mosaic still be speaking to him if he’s jump out of Cyclops’ body? That’s not how it was with Magneto. 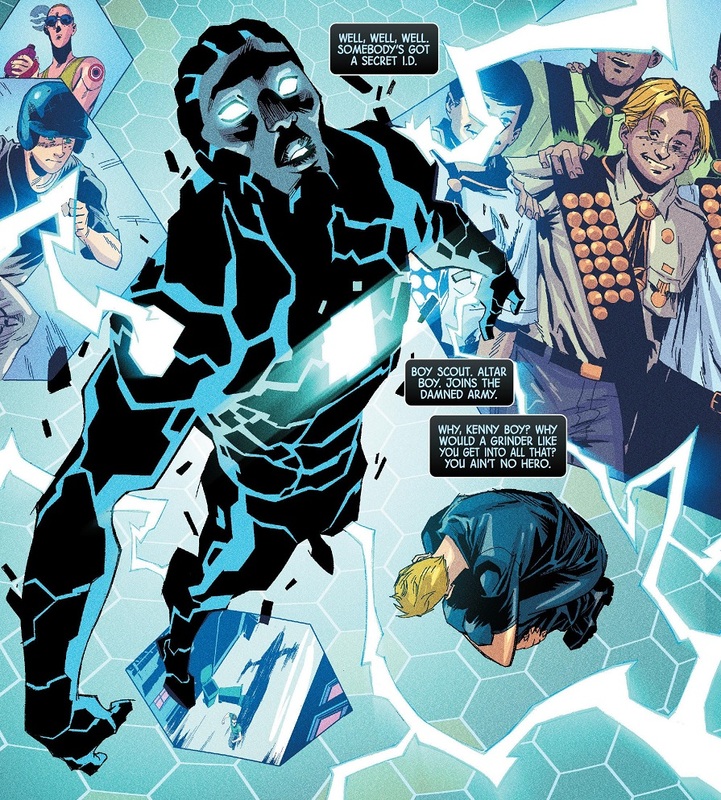 Here we have a brand new character, Mosaic, who Marvel deemed worthy enough to get his own ongoing series. And it can’t be a coincidence that Mosaic debuted ahead of Inhumans vs. X-Men. No doubt Marvel wanted to use him in this series. His powers are strange, I’ll grant them that, but apparently Marvel can’t get them ironed out in time for the big Inhumans crossover, for which he was likely created in the first place. It wouldn’t be such a big deal if Young Cyclops’ story arc didn’t hinge entirely on getting Mosaic’s powers wrong. And again, I kid because I love. No new updates to the Strong Guy Watch. He didn’t make any appearance in Inhumans vs. X-Men #4. But speaking of strong guys, Colossus gets a couple badass moments. So at least that’s something. Posted on February 9, 2017, in Comics, Marvel, X-Men and tagged Colossus, Cyclops, Inhumans, Inhumans vs. X-Men, Mosaic. Bookmark the permalink. 8 Comments. My guess is the Inhuman leadership will still want to screw the mutants over and tell them to leave to another planet or die, but the new inhumans will rebel and allow them to change the myst, which will lead to an Inhuman civil war. Which I won’t care about in the slightest unless is revealed that under orders by Black Bolt and Medusa an inhuman was using his powers/a machine to improve the opinion of inhumans and make the entire world think that what Cyclops did was unforgivable so the fact that they killed a man doesn’t affect the Inhuman population, and once it comes out that they were using mind control to affect their opinion of them, hell, maybe make it so that’s why half of the hero population was crazy about Ulises because that might explain why everybody was so out of character during that event, the people will distrust all Inhumans even more than mutants. But I’m also definitely thinking that there’s going to be a split between the Inhuman leadership and the new Inhumans. Maybe that’s why the Royals will be getting their own upcoming comic series that, I think, has them leaving Earth. I would definitely be down for some Inhuman comeuppance! Left a post on one of you older posts but they actually do have an Inhuman who is manipulating politicians and humans into liking Inhumans and their agendas. 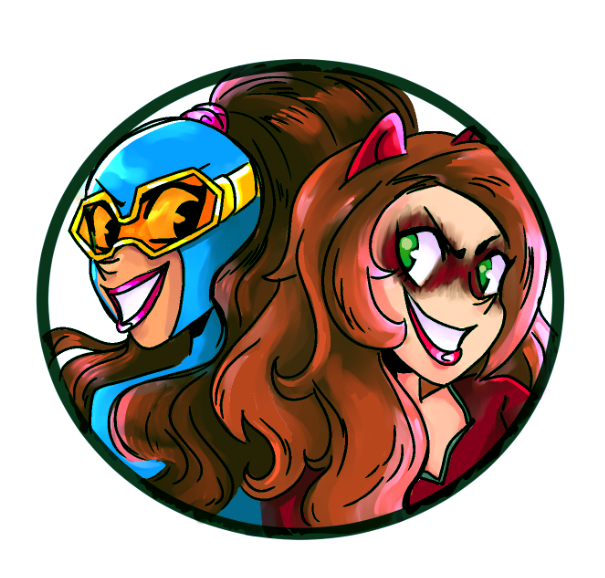 She’s name Captain Swain and while she calls her power “psychic nudging” (similar to Kilgrave/Purple Man calling his power pushing) where she bends a person’s will to coincide with what she wants them to believe/do. In fact her opening book was actually about her being ordered by Medusa to mind control some foreign dignitaries who were invited to Attilan so they could manipulate them into accepting Inhumans and giving them good publicity/political favors later on. At first her powers didn’t work on them which made Swain feel like a failure but they have her do a “you can do it” arc with her calming down an embodiment of several Inhumans who were killed in a foreign country by supressing his will (to be fair the embodiment wanted to genocide the humans of his country to get even but it shows that her powers are still mind control). Afterwards the book closes with her new lease on her powers as she successfully “nudges” the politicians into what Medusa and the Inhumans want them to do. Well all of that sounds pretty fun. All great points, Sean. But Mosaic used Scott’s body to fly the Blackbird, so apparently he hadn’t left it just yet? And if Scott really will be out for twelve hours, maybe that just started? It’s weird. Also, maybe Mosaic would’ve expected Eric to be out for twelve hours, but Eric’s such a badass that he just shook it off and moved on? Loved when you said the previous issue revealed young Cyclops to be an idiot. He’s out of his head, alright. I get the feeling that Lemire’s been rushed on this series and maybe has more characters than he can effectively handle right now. I really liked Peter in this issue, but I thought it was really weird when he said, “Is no problem, Ororo.” I get that it’s portraying his Russian accent, but doesn’t he usually speak better English than that? Ah, but Mosaic actually says in that last panel I posted “Body’s all yours. I’m out.” So Mosaic is definitely gone when he tells Scott he has 12 hours. There are examples in the regular Mosaic comic that refute the 12 hour thing, but I went with the Magneto example because it was easier. So really, the 12 hour thing pretty much only exists in that issue of All-New X-Men. 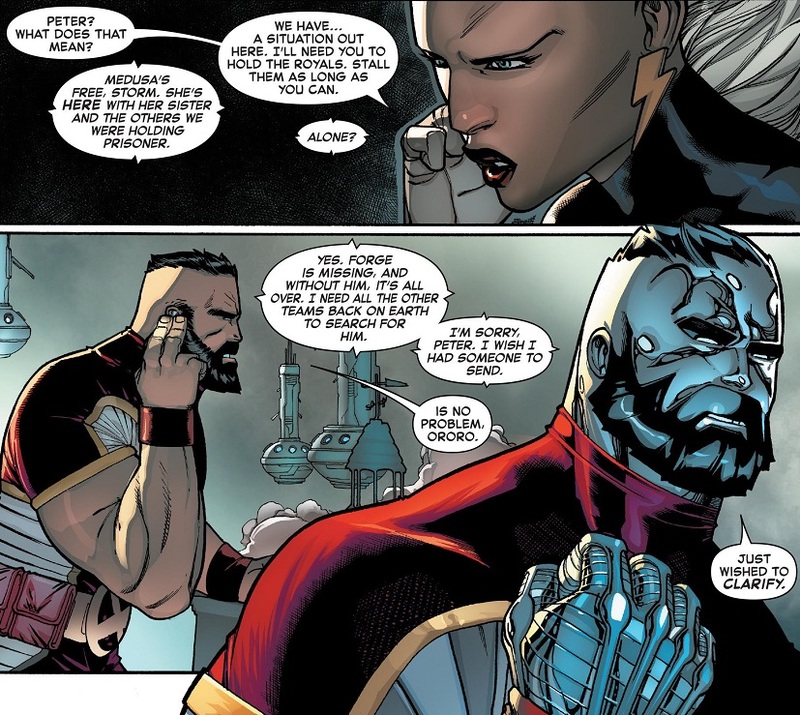 As for Colossus’ accent, all characters with accents in comics ebb and flow depending on the writer. Personally, I think him saying “Is no problem” in a thick Russian accent sounds more badass.